Summer is officially here! And for most, that means vacation time. This is something we look forward to and plan for all year. For me this year, that means licensing school, which isn't really a vacation per se, but is something that I am eager to do because it means that afterwards I will be able to fulfill my calling in a greater capacity (and I won't have to bother Pastor Lance as much!). For others, however, it could mean a week of lounging on a beach, hiking through the mountains, or even riding roller coasters. Whatever it is that refreshes your spirit and renews your mind. You come back from a vacation feeling energized and ready to face the world once again (or at least you should). The Lord knows that rest is important. Even God rested after he created the universe. The Bible says in Genesis 2, "So the creation of the heavens and the earth and everything in them was completed. On the seventh day God had finished his work of creation, so He rested from all his work. And God blessed the seventh day and declared it holy, because it was the day when He rested from all his work of creation. " In fact, under Old Testament law it was mandatory to honor the Sabbath as a day of rest. In addition, every seventh year the Israelites were ordered to let their fields rest, there were special feast days throughout the year, and every 50th year was proclaimed the year of Jubilee (see Leviticus 25). All of this illustrates the importance of rest, something instituted and ordained by God Himself. In today's society, however, it seems there are too many people at either end of the spectrum, and not enough that have figured out how to maintain a proper balance in their life. On the one hand, you have the workaholics. They think of 'rest' as a four-letter-word. You rarely see them sitting still for more than minute. They are always 3 thoughts ahead in every conversation, and have a PHD in multi-tasking. Even their hobbies are anything but restful. For instance, I personally know someone who enjoys running when it is 90 degrees outside, as a way to 'relax' and de-stress. I won't mention any names, but she has a spouse who works on cars for a living 10 hours a day, and then does it for several hours more in the evening as a hobby! Then you have those at the opposite end of the spectrum. Instead of desiring to work 6 days a week and rest for one, they would love nothing more than to work one day a week, and rest for 6, or even 7, if they could find a way. They have fine-tuned the art of dodging anything that requires any effort on their part. Their excuse book is so thick it takes up an entire bookshelf by itself. The New Living Translation of Romans 12:11 says, "Never be lazy, but work hard and serve the Lord enthusiastically. " God does not reward laziness, so do not take away from today's message that I am encouraging you to take God's gift of rest as yet another excuse to not do meaningful work. So what does our Epistle reading (Hebrews 4:1-11) mean when it says those who believe have entered His rest? First of all it refers to the 'rest of grace'. Our salvation is by grace alone through faith, and not through works. While we are to serve God and work diligently here on earth, we are not under the heavy burden of the Old Testament law, for Christ fulfilled that for us. We are called only to love God and love others. God gives us many blessings here on earth, and He wants us to enjoy them. These include our rest days, our vacations, and our family time. He wants us to spend time alone with Him as well, in prayer, praise, and His Word. These verses also refer to our heavenly rest, when our lives on earth are through. Those who have never accepted Christ as their Savior will never enter that rest. Their eternity will never have any peace, any comfort, or any type of rest whatsoever. They will be in physical, mental, and spiritual torment as they will be separated forever from the God from whom proceeds all that is good. To quote Matthew Henry's commentary, "Those who do not believe, shall never enter into this spiritual rest, either of grace here or glory hereafter. 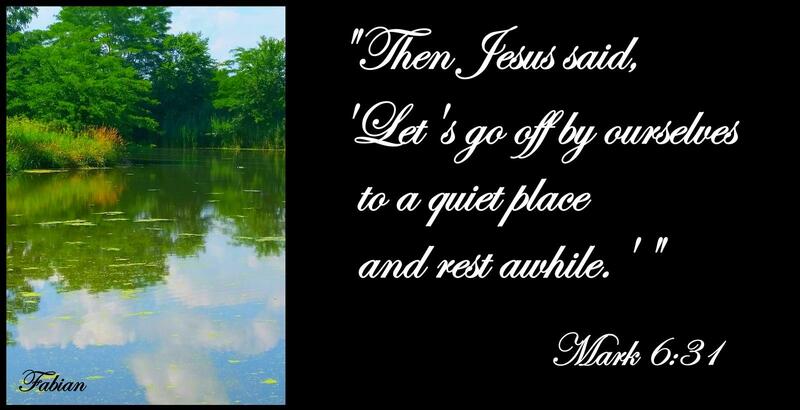 God has always declared man's rest to be in him, and his love to be the only real happiness of the soul; and faith in his promises, through his Son, to be the only way of entering that rest."
So where are you in regards to rest? Are you trying to earn your way into heaven? Stop! Put your faith in Christ. You will never do enough to earn heaven on your own no matter how hard you try. Take a rest. Jesus did the work. On the other hand, do you think that God just wants you to eat, drink, and be merry while you are here on earth? There are souls to save and people in need. The church is the physical presence of God in the world, and as the Body of Christ we are called to do His work here. But enjoy your rest days. Take a vacation once in a while. Renew your spirits. And praise God for His grace, and for the promise of eternal rest as well. "This is the day that the LORD has made; let us rejoice and be glad in it!" (Psalm 118:24) Amen.